My super talented friend Sarah Thompson has created a Facebook group called Un.flash Photography where there is a weekly photography challenge! I love any excuse to get my Canon out for a play, so of course I'm playing along! It's open for anyone to join, so if you're on Facebook then you should play along with us! This week is the very first challenge and the theme is - "YOUR INNER EMO - a shot that best describes your current mood/emotional state - Criteria/Technique - BLACK & WHITE PHOTOS". You can upload up to 3 photos for each challenge, so I did! 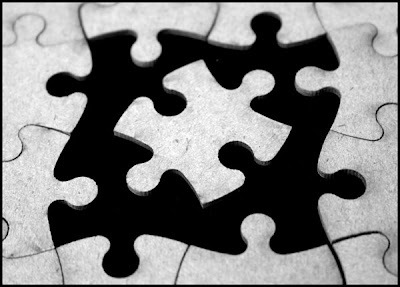 I've gone with a theme of puzzle pieces, symbolising being "Puzzled". This first photo really conveys how I'm feeling at the moment. 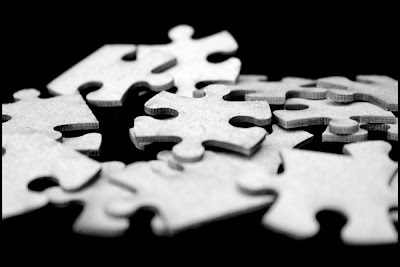 I feel like that centre puzzle piece with all sorts of challenges around me that once sorted will come together nicely to make the big picture, it's just a matter of working through it all. You'll notice that all the pieces in my photos are blank too, making it a harder puzzle to solve, which further represents the challenges ahead. The 2nd photo is about how I'm feeling as we've just bought a new house! There is so much to organise and take care of - so many forms with confusing jargon and I'm feeling puzzled and a little overwhelmed by it all! 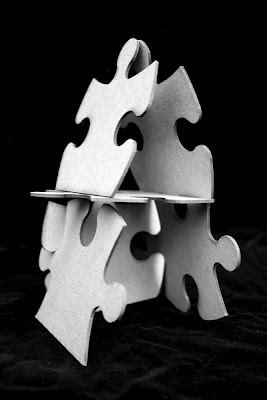 The pieces are stacked to make a house, much like a house of cards - this conveys a fragility that reflects my fears and emotions at the moment. Last but not least we have photo number 3. This one is more about fitting in, as well as having lots of choices and decisions to make. That centre piece can fit into any one of the 4 available spots - only it doesn't know which one to go to. Too many options. Big decisions to make. Needs to find a place to belong. Just a matter of deciding which option to choose for the best outcome. So yeah - lots of changes coming up for me and my family - a new house, a big move, my DD starting school next year just to name a few! A very exciting time which is also very scary and new for us! Very deep :) Love it. Reminds me of when I studied photography in art school and had to have a meaning to every photo I took. It couldn't just be pretty. There had to be some thought behind it. I love what you have done. Esp as the last one the puzzle is coming together. I do so love your analogy behind those photos Sarah - how very clever of you! I also wanted to let you know that I've left you a little something over on my blog too! Wow Sarah! 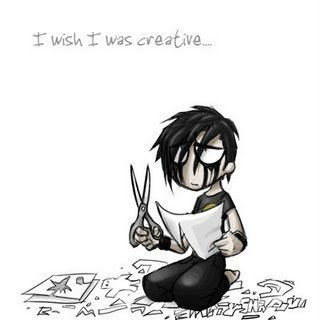 Your photo's are fantastic and it looks like your "Emo's" a very busy one! Thanks for sharing ..
Beautiful symbolism, Sarah~and photos are lovely, too! these are just awsome, luv your whole concept! Love - it for all the reasons everyone else has given already.